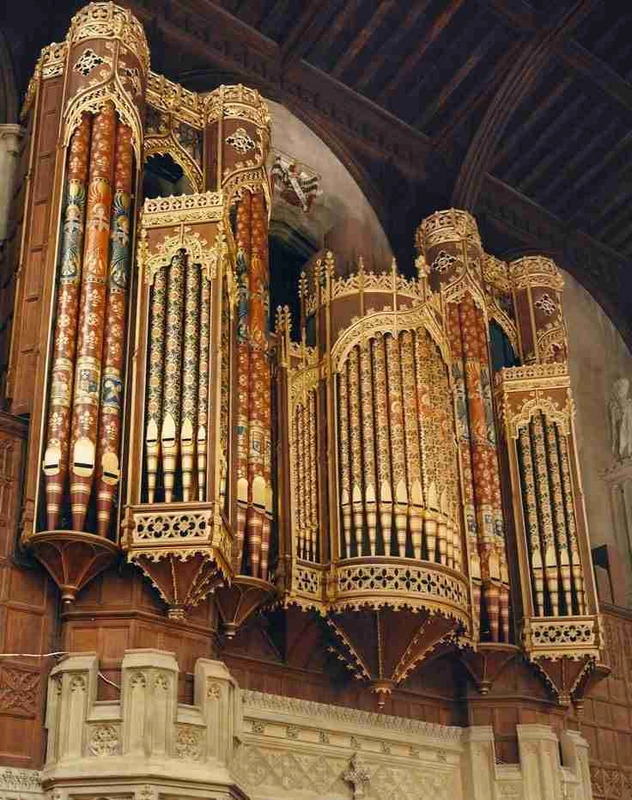 The Hill organ in Eton College Chapel was built in 1885, re-using a little earlier pipework - notably the 32' basses which J L Pearson cleverly incorporated into his magnificent new double case. The lavish decoration was by Clayton and Bell. The instrument was rebuilt by Hill, with new soundboards and action, in 1902, and was in every way typical of the finest of the firm's output. Modifications during the following 60 years were aimed first at increasing the smoothness and power, and later the brightness and clarity, of this essentially Romantic organ. The result was confusion, both mechanically and tonally, and the recent reconstruction has centred around reversing the changes made since 1902, and accepting the instrument's original weaknesses along with its many strengths. The pneumatic action has been restored and completely re-tubed - over five miles of new lead tubing being used. The Choir Organ was returned to its own case, and much of the Pedal Organ was given its own slider soundboard. Tonal changes made in recent years were reversed, although the 32' reed, ingeniously wedged in 50 years ago, was retained. The case-fronts were magnificently restored by Anna Plowden.